Well, really, the chicken is an afterthought. 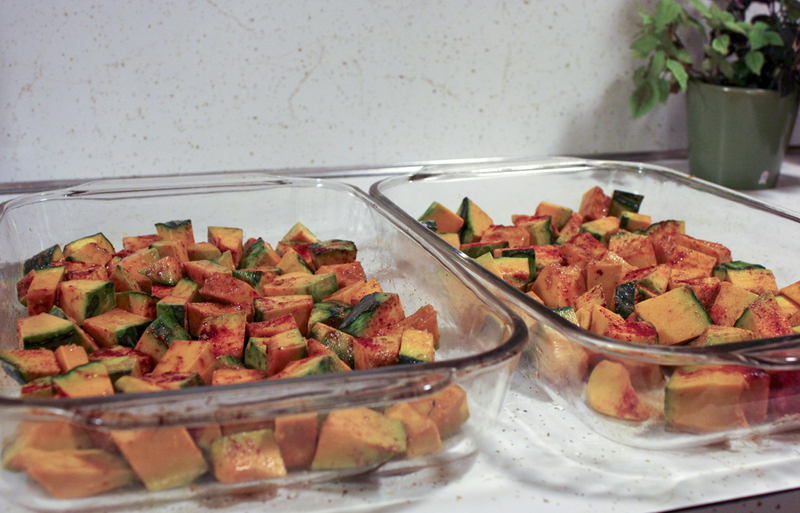 More like, "roasted kabocha squash with toasted cumin salt and pimentón de la vera. Oh, and roast chicken with smoky salsa". I don't know, it was all really good. 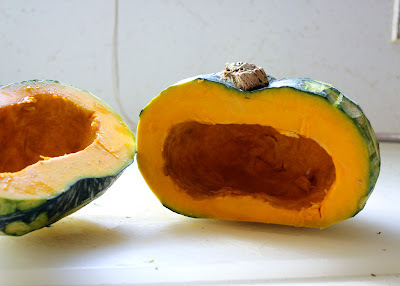 And believe me, I thought loonnnggg and hard before making a winter squash. I even called my mom about it. She said, "Come on Jule, it's past the middle of September." Sold. But now, there's no turning back! 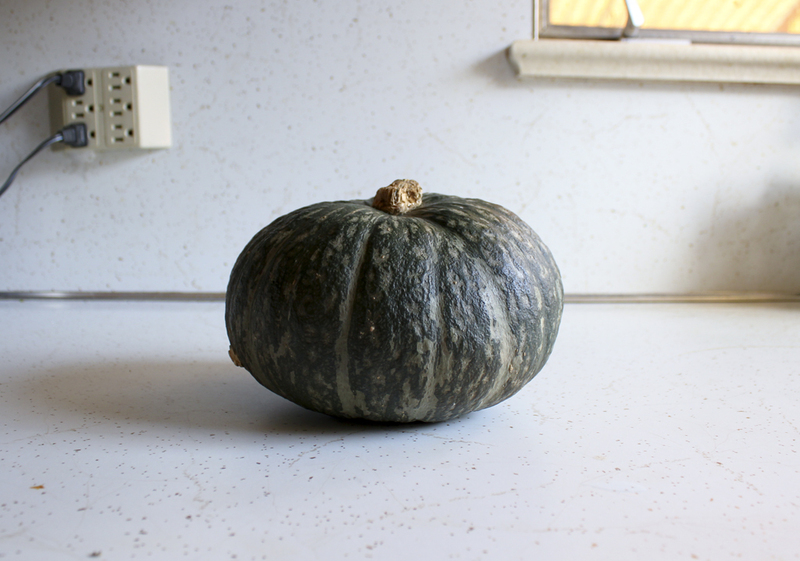 Winter squash is on its way to dominating my kitchen counters. Despite how I hate peeling and cutting them (yet I will continue to, because cubed and roasted is my favorite way to eat them), they're an absolute fixture in my winter meals. I have to say, this meal is kind of a pain. I felt like I was working on it all day. That's partially because I kept doing things in between steps. Ran an errand, went to the gym, got sucked into Cat Vortex... but to be on the safe side, I'd relegate this to a weekend meal. A nice, crisp fall weekend preferably. The oven is on a lot. It's fun to have the oven heat up the kitchen and have the windows open blowing in cool air. Since the squash and the chicken are roasted at different temperatures, most people will have to cook them one after the other. I have that second range in the basement (that has two ovens) so I can use three ovens at different temperatures at the same time. That's pretty spoiling. Do the squash first, put some aluminum foil over it to keep it at least semi-warm while the chicken cooks. You can always chuck it back in the oven the last ten minutes or so of the chicken's cooking time. The salsa requires broiling time, yet another oven temperature. I'd do this first, just to get it out of the way. If you have a kitchen helper, someone can work on the salsa while the other preps the squash. Of course, you can always grill or stovetop (can that be a verb?) the chicken. That'll at least allow you to have both the squash and the meat done at the same time. I almost didn't want to include the chicken in this post. Unless the meat is prepared in some notable or definitive way, it's not really up my alley to post it. You don't really need a food blog to post about boiled chicken and steamed broccoli. If that's what you're cooking, fine, but I'm pretty sure you can think that up yourself. But I realized I haven't done much else than vegetable recipes recently and I did obviously eat roasted chicken with my roasted squash so I figured I'd add it in. Plus, the salsa is really freaking good on top of the chicken. Speaking of posting recipes of interesting preparations of meat, I'm eyeing a porchetta recipe. I just need to procure a skin-on pork belly. I wish that kind of stuff wasn't so hard to find. I might have luck if I go to some sort of ethnic market. But I don't know, I mean, I'm all f*** the FDA and all, but I do hold some standards. I've smelled enough Asian fish markets to be a little sketched out about other countries' ideas of edible. 1. Preheat the broiler in your oven. Line a baking sheet with foil and place skin-side down tomatoes, peppers, and the unpeeled garlic cloves. Broil for 10 minutes. At this point the garlic will be done, so you can take that off the baking sheet. 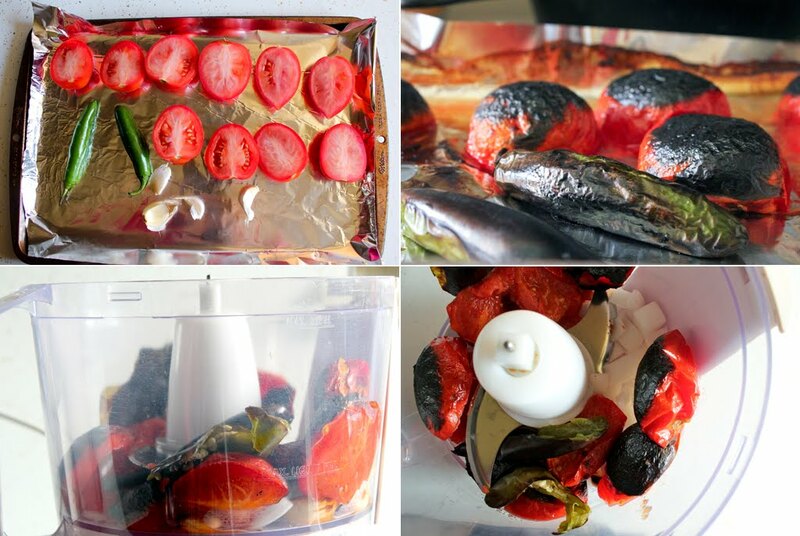 The tomatoes and peppers you can flip and broil for about 5 minutes more. I charred my tomatoes a little too much, but it was still okay. 2. Remove the tops from the peppers and skin them. If it seems a little hard, you can put them in a paper bag to steam for a bit, but I had no trouble since they're so small. A little skin won't hurt you anyway. Split them open and scrape out the seeds, if you wish. I scraped out the seeds of one and left the other. 3. Peel the skin off of the garlic cloves. Put peeled garlic in a food processor along with the tomatoes, peppers, onion, cilantro, and salt. I forgot the cilantro. I might never forgive myself. Blend to desired chunkiness. I made it a little chunkier than like store bought salsa. To peel the squash, use a sharp knife and cut away from you. It's not the most fun. You don't have to go too deep or worry about the skin in the valleys of the ridges - I actually really like bits of the skin and the layer right underneath it. It's kind of like the rind on cheese. 1. Heat a small dry skillet over medium high heat and toast cumin seeds for a couple minutes, until fragrant. 2. 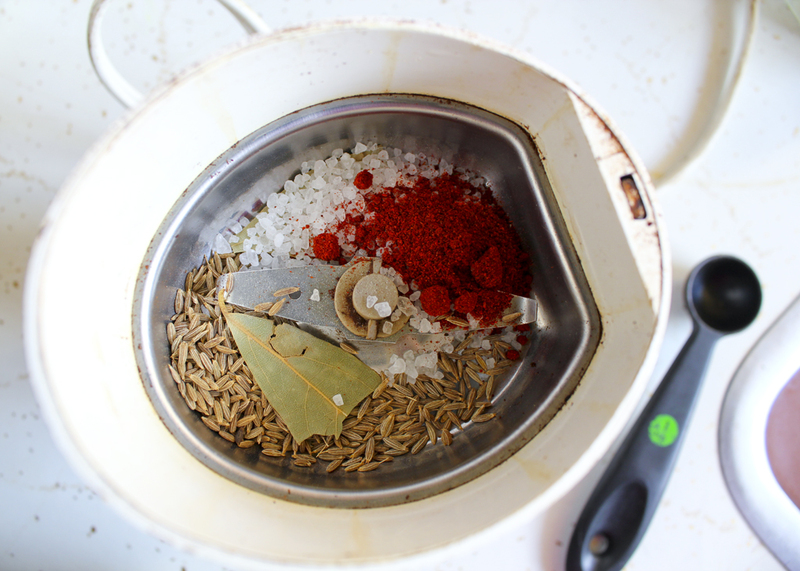 In a spice or coffee grinder, grind cumin, bay leafs and salt. Mix in paprika. 3. Preheat oven to 375 degrees. 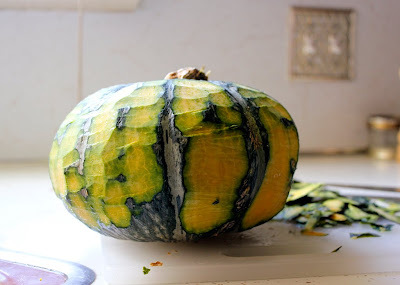 Toss squash with olive oil and desired amount of spice mix until evenly coated. Depending on the size of your squash, you might want to only mix in half or so of the spices. You want to at least be able to see that there are spices on the cubes. You can always sprinkle on a little more once it's done and you've tasted a cube. 4. Spread squash in a single layer in a baking pan or two. Bake for 35 minutes, or until fork tender and crisped. Preheat oven to 450. Coat chicken in oil and generously sprinkle with coarse sea salt and freshly ground pepper. Place in a baking pan or more and roast for about 45 minutes. If your chicken pieces are on the large size, you might need 10 minutes more. Skin should be crispy (you can crisp it up even more under the broiler for a few minutes if you'd like). Use a thermometer and check for an internal temp of 165. My thermometer never seems to be calibrated, so I just check that the insides aren't pink. Phew! There it is! 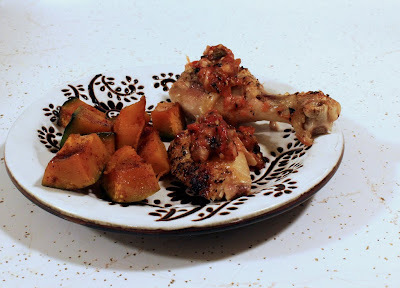 Top the chicken with some of that salsa and a bunch of those wonderful little squash chunks. Avocado is more than welcome to join.